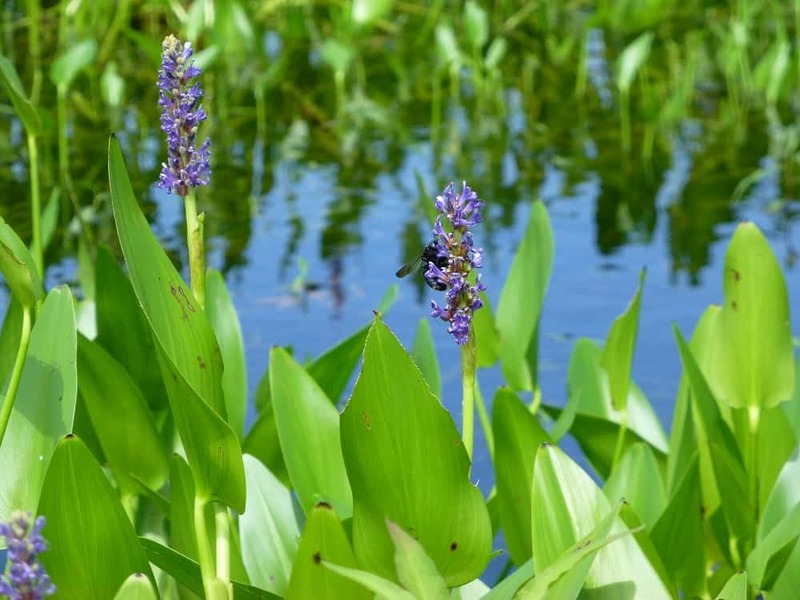 Pickerelweed, Pontederia cordata, is a native aquatic plant found in shallow ponds, streams, marshes, and wet ditches. It has a clump forming habit and spreads by short rhizomes. The clumps grow larger each year and colonize, but it is not considered to grow aggressively. It attains a height of approximately three feet above the water, or mud. Its leaves grow on long, fleshy stalks, are arrowhead shaped, and are three to seven inches in length. They become dormant in the winter. Young, unfurled, leaves are edible and can be added to salads or boiled for ten minutes and served with butter. Its blooms, which grow on conspicuous spikes, appear in late spring and continue blooming until early fall. The flower spikes grow on fleshy stems, and are six inches in length, purple-blue, and rarely white. The blooms provide nectar for a number of insects including bees, wasps, and butterflies. The red, sticky fruit is considered an important wildlife food and is eaten by ducks and other animals. Each fruit contains a single starchy seed which, in addition to the leaves, is edible. The seeds are very nutritious and can be eaten out of hand, dried, or added to cereals. They can also be roasted and ground into flour. It is easy to propagate through root division, and may be divided during the blooming season. 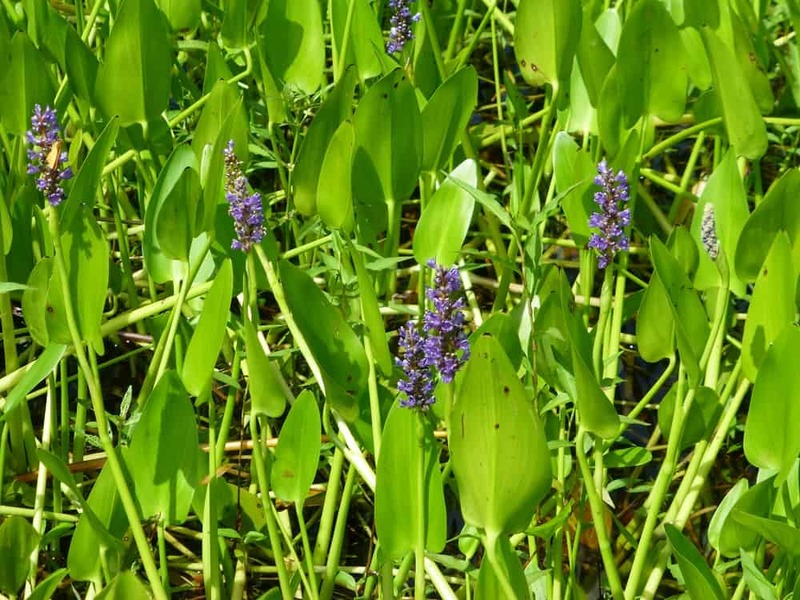 Some native plant nurseries, and pond supply stores, in our area carry pickerelweed. It is actually much easier to locate a pond and put on your wellies and get a few to transplant.